Have you ever seen something random that totally restores your sense of wonder in the world? Something like: a double rainbow, a bushel of ears-not-up-yet corgis, or maybe even a truck filled to the brim with green beans? I saw the last one on a recent road trip and Mike kindly tried to keep alongside while I snapped picture after picture. I know it’s weird to get excited about a truck full of green beans, but really, you don’t see that kind of stuff every day! It made me SO happy. You know what else makes me weirdly happy? Five meat-free recipes in a row. It’s crazy though – who am I turning into, a vegetarian? Kidding! I had steak two nights in a row. But, if you’re a non-meat eater, this salad is one of those recipes where you definitely won’t miss the meat. Then again, I wouldn’t turn my nose up at these beans with a side of honey mustard chicken thighs. Mustard is definitely one of my staple condiments. I have a tendency to add it to anything and everything. 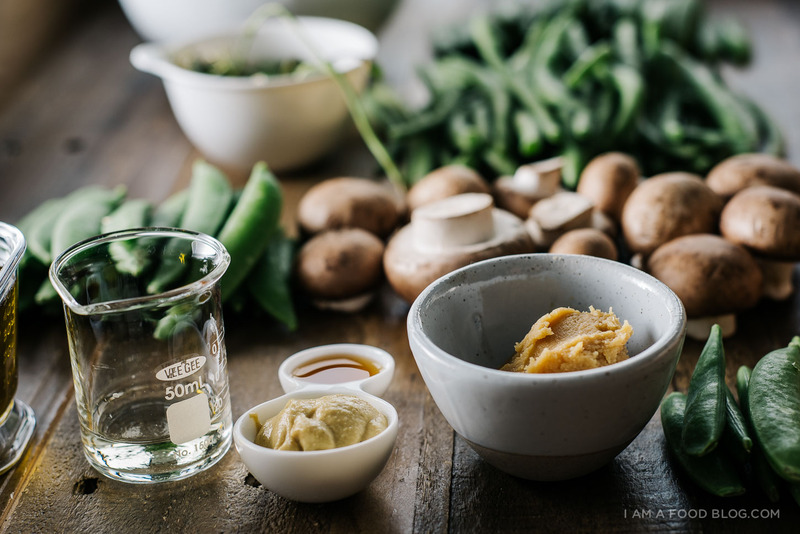 It’s completely the same story with miso, if I’m looking for a bit of extra umami oomph. Mix them together and you’ve got a tangy, addictive sauce you just want more and more of. Think of it like a savory PB&J. Miso and mustard go great on meat, fish, and, of course, vegetables. 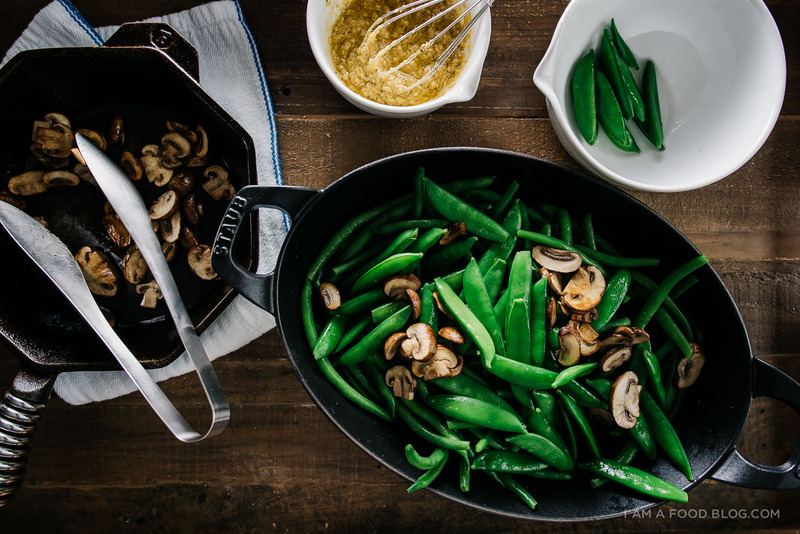 Think: tender, crispy beans, snap peas, and pan-roasted mushrooms tossed in a crushed sesame miso-mustard dressing. Seriously good. As good as passing by a green bean filled truck on the highway! Heat 1 tablespoon oil in a large skillet over medium-high heat. 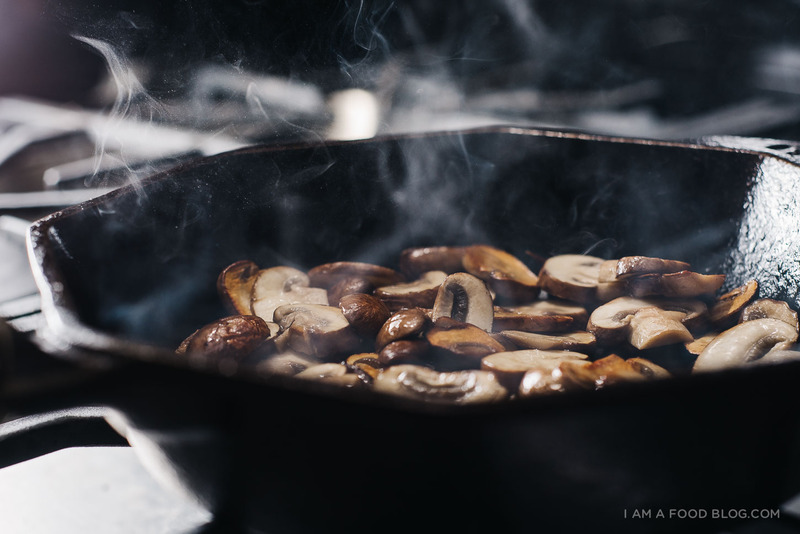 Add the mushrooms and cook without moving until caramelized, about 4-5 minutes. Flip and continue to cook until tender. Set aside. Bring a large pot of salted water to a boil. 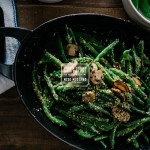 Add the beans and sugar snap peas and cook, uncovered, until bright green, crisp and tender, about 2-3 minutes. Prepare an ice bath in a large bowl. Drain beans in colander and transfer to the ice bath to stop cooking. When beans are cool, drain and let dry. Crush the sesame seeds in a mortar and pestle. Whisk the remaining oil, miso, vinegar, dijon, sesame oil, pepper. 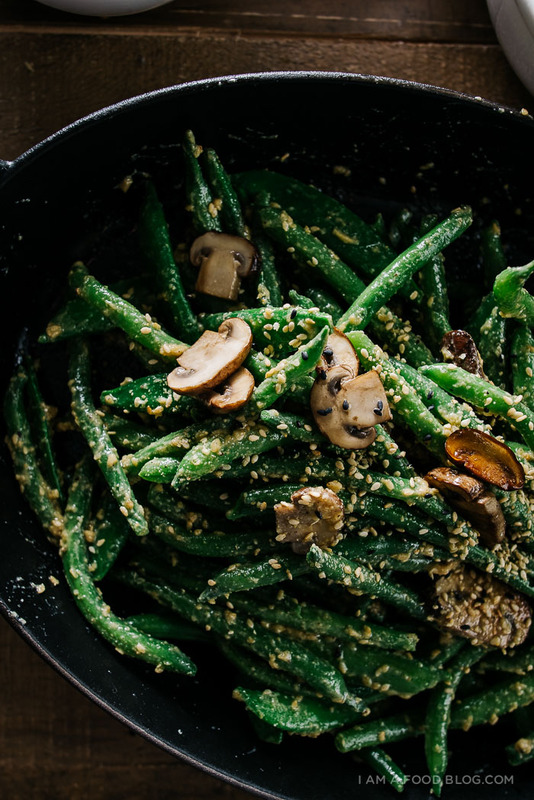 Toss the beans and mushrooms with the dressing and enjoy immediately. Green beans just thanked you for amping their popularity by 5,112,746!!!!! This is so my kinda salad! mustard and miso sound like a really interesting combo- don’t think i’ve tried that one before. can’t wait to try it and branch out from my “let’s add fish sauce and sesame oil to everything” mentality. I would love to see a green bean truck! 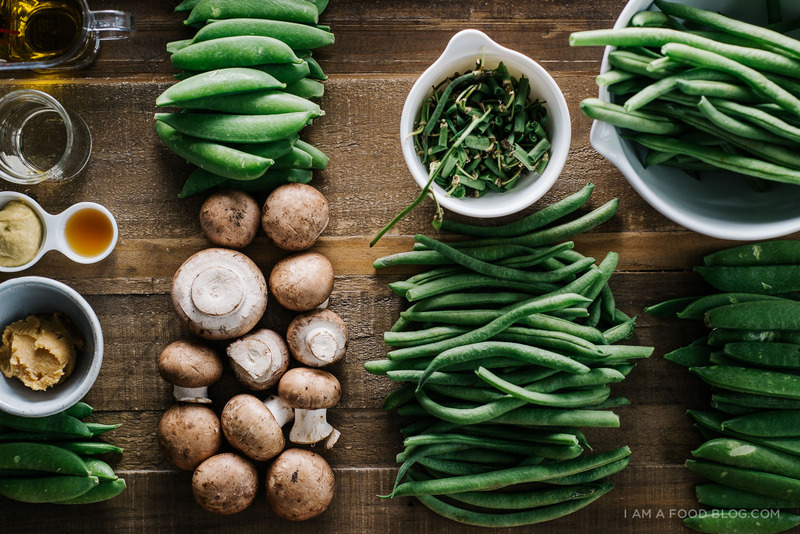 Actually, I would live to have a truck full of green beans delivered to me. 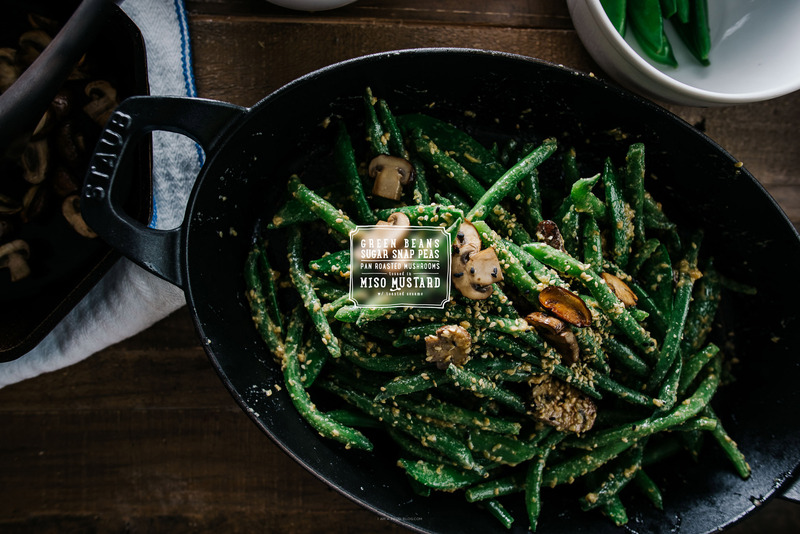 Definitely one of my favorite vegetables to serve with dinner. And this dressing looks SO SO good. That mustard miso pairing sounds so genius. They look deliciously tasty and I’d totally stop and take photos too! I’d love to make it but I can’t get a hold of crimini mushrooms in the UK. Any suggestions for substitutes?